While we were in Boston, I had my first taste of American style, still, homemade lemonade and I loved it. I bought it at every lemonade stand we came across, whether it was at the baseball, in the park, at the festival we attended or just on a street corner. One time I peeked my head over the counter to watch how it was made and I was stunned at the simplicity. It's so simple, yet so tasty - I had to come home and give it a go myself! These quantities are approximate - based on my personal preferences. Once you know the ingredients and method, you can adjust the quantities to suit your tastes! This recipe is super simple but such a refreshing summer drink - why not increase the quantities and make a jug to take to a BBQ? 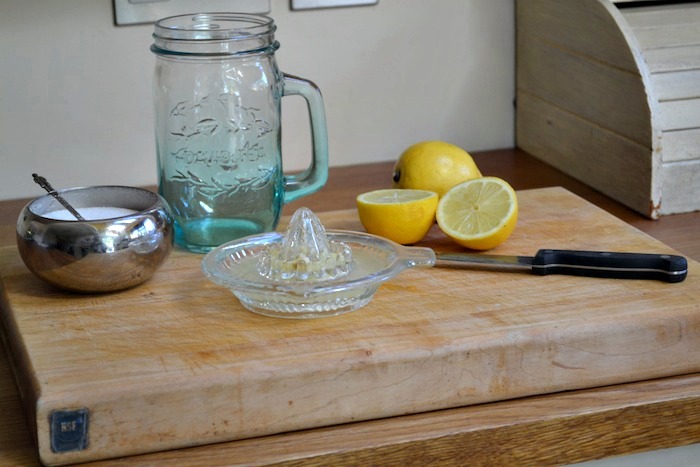 Let me know if you try this lemonade yourself - I hope you enjoy! If you're stunning photo's are anything to go by, this must taste amazing! I really keep meaning to try out some homemade lemonade but I never get around to it! Looks like so much fun - & i like the fact you know every ingredient that's gone in to it, much healthier!